No regex required in this case. Edit > Blank Operations > Trim leading Space. This is how I do it very easily. Let's say I want to merge all my lines but separate them with a semi colon. As @Karan answers regex it's not necessary to solve your question, anywise you can use it to do it in one step and to avoid errors with different UNIX/Windows end lines (\n or \r\n). Not the answer you're looking for? 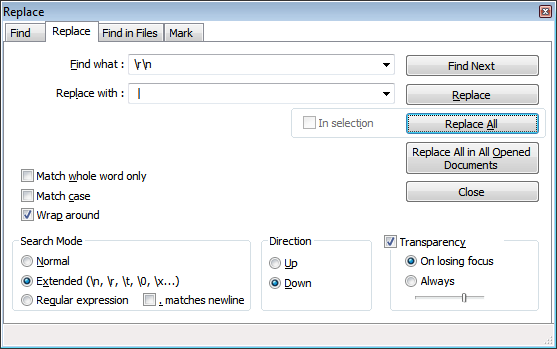 Browse other questions tagged notepad++ regex or ask your own question. 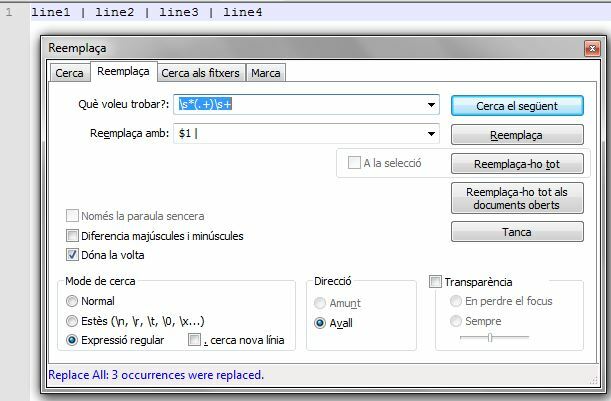 Notepad++ Find and Replace: Wildcard Varying Number of Lines? How can I replace the first several characters on multiple lines in Notepad++?